These have been Discontinued....What's Left is IT!. The 80% Tungsten Aliens have black grooves and are available in 3 distinctive black-coated knurling styles to choose from. 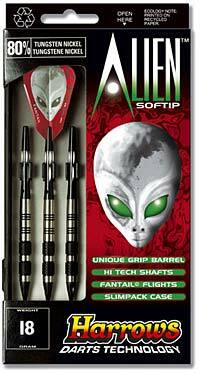 They come with attractive Aztec shafts and Fantail flights, making them, truly, out of this world.